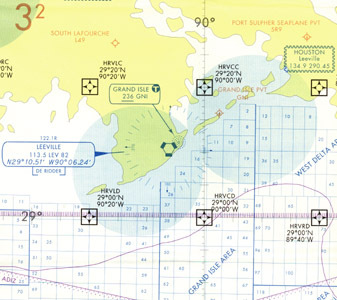 U.S. Gulf Coast VFR Aeronautical Chart is designed primarily for helicopter operations in the Gulf of Mexico area. Information depicted includes offshore mineral leasing areas and blocks, oil drilling platforms, and high-density helicopter activity areas, 55x27 inches folded to 5x10 inches. Revised annually.